One of the original ingredients in the famous Worcestershire sauce, tamarind (Tamarindus indica) is a delicious, tropical pod-fruit native to the African continent. It is a great source of iron and magnesium, two dietary minerals our body requires for producing red blood cells and maintaining healthy muscles, heart included. Moreover, tamarind contains generous amounts of phosphorus, potassium and thiamine, contributing to bone and digestive health, regulating blood pressure levels as well as supporting brain and nervous system activity. Having an excellent dietary fiber content, ripe tamarind is an excellent natural laxative, helping relieve constipation easily. Moreover, due to special compounds found in its pulp, this fruit-spice is said to help with biliary problems and provide antioxidant protection against oxidative stress, protecting cells and DNA against oxidative damage and its long-term effects. As an important source of pectin, the fruit can also help treat diarrhea. What does tamarind look like? Tamarind is the name given to both the tree and the fruit scientifically known as Tamarindus indica. The fruit, also known as Indian date, is a curved brown pod ranging from 10-15 cm in length. While the pod (outer shell) is hard, the fruit is soft, juicy, fleshy and reddish-brown or plain dark brown in color. Seeds vary according to pod length: longer pods can have up to 12 flat, shiny, brown seeds, while shorter ones range from 1 to 5-6 seeds. Overall, the tamarind looks similar in appearance to peanuts. What does tamarind taste like? Although quite sour in taste, unripe tamarind is edible. Ripe tamarind is meaty, juicy, both sweet and sour. The riper the fruit, the sweeter its flesh. The tartness is a result of the fruit’s high tartaric acid content. Tartaric acid is added in many foods as food additive E334. It can also be found in bananas and makes a pretty good leavening agent when combined with baking soda. This must be why bananas make such a good bread and pancake mix. How much tamarind should one eat? I feel this is an important question to be asked because the tamarind may pose some health risks if consumed in excessive amounts. While the above-mentioned tartaric acid is a potent antioxidant, it is also toxic for our muscles. For instance, ingesting more than 412,5 g of pure tartaric acid can be fatal for a person weighing 55 kg (7.5 g/kg). Bottom line is, although eating a handful of tamarinds will not kill you, it might not be in your best interest to consume excessive amounts (kg) of tamarind daily. 1) Excellent natural laxative. 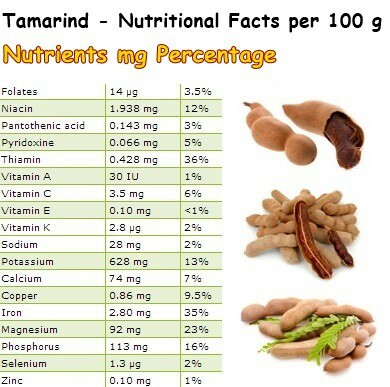 With 5.1 g of dietary fiber/100 g of fruit pulp, tamarinds make an efficient natural laxative. Dietary fiber adds bulk to stools and promotes regular bowel movements, thus relieving constipation. Moreover, by reducing the time our colon is exposed to the toxins in waste material, as well as by supporting healthy, natural fermentation processes within the digestive tract, dietary fiber helps maintain digestive health. Studies suggest this may help reduce colon cancer risks. Pectin is a special type of dietary fiber found in tamarind (also in apples, some berries and citrus fruit). Pectin is what helps tamarind and other fruits bind well when made into jams, jellies and sauces. It’s also what makes the fruit efficient against both constipation and diarrhea (read full article on the benefits of pectin). 2) Promotes digestive health. The dietary fiber in tamarinds is part soluble, part insoluble. While insoluble fiber adds bulk to and softens stools, shortening transit time (meaning no more constipation), soluble dietary fiber is fermented by bacteria found naturally in the digestive tract and thus promotes digestive health. Healthy gut bacteria means a healthier gut, better equipped to take in nutrients from food. 3) Natural remedy for biliary and cholesterol problems. Special compounds in tamarinds, in addition to dietary fiber, have been shown to bind to the bile salts from cholesterol, preventing full reabsorption at colon level and contributing to lowering blood cholesterol levels. 4) Offers antioxidant protection. 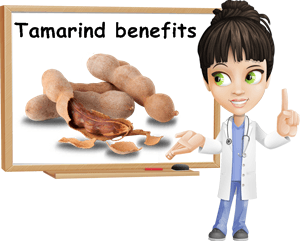 Tamarinds are a great source of potent antioxidants (tartaric acid included) which protect cells and DNA against free radical damage buildup known as oxidative stress. Free radical damage build represents the starting point for chronic disease. 5) Antimicrobial properties. Research suggests that tamarind is a powerful natural antimicrobial. Studies have shown it to be efficient against Candida albicans and even Staphylococcus aureus (responsible for sinusitis, food poisoning). However, if you suspect any such infection, it is best you first talk to your doctor and together weigh in on your options. 6) Good source of vitamin B1, iron, magnesium and potassium. Iron supports the production of red blood cells which transport oxygen from lungs to muscles, organs and so on, giving us energy to go about our day. Iron deficiency will cause anemia and subsequent symptoms of fatigue, irritability etc. Vitamin B1 (thiamine) promotes good muscle tone (stomach and intestinal walls especially), brain and cardiovascular health. Magnesium not only increases calcium absorption in bones and teeth, but also supports muscle activity, the cardiac muscle being the first to benefit from a good magnesium intake. Last but not least, potassium regulates body fluids and blood pressure contributing to good cardiovascular health. 7) Promotes the excretion of fluoride. Several studies have revealed that ingesting small amounts of tamarind for a set period of time can significantly increase the excretion of fluoride, an inorganic compound added to tap water, toothpaste, etc. When consumed in large amounts, fluoride can pose certain health risks, including brown spots on teeth and tooth irregularities. For this reason, stimulating the excretion of fluoride naturally can be of great help for keeping in good health. Conclusion. Overall, tamarinds owe their health benefits to a variety of natural compounds such as polysaccharides, hemicellulose, mucilage, pectin, tannins, tartaric acid and volatile oils such as limonene, geraniol, safrole, cinnamic acid, methyl salicylate (also found in mouthwash) and pyrazine with great antioxidant, antimicrobial properties. Traditional medical practices recommend the use of the fruit’s pulp and seeds, flowers, leaves and bark for the treatment of malaria fever (applied as a poultice), toothaches, stomach cramps, flatulence (stomach gas), loose stools and constipation.